Classes and Programme updates and why 2019 is a big year for us. I hope this New Year is treating you well so far. 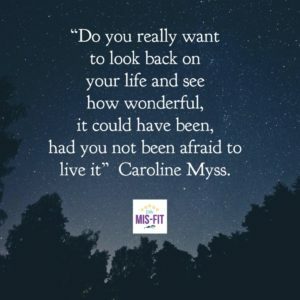 2019 is a big year , here at Little Mis Fit – Its my first year teaching full time , after 8 years of juggling two jobs , I’ve finally gone full time with Little Mis Fit, which is exciting , though a little scary too. I also have a big birthday this year as does my boyfriend and a lot of my friends , so lots of fun things planned too. I also have a few ideas for Little Mis Fit so I’m busy working away on those too. Are you on Instgram? , If so come give us a follow -@littlemisfitjojo. Follow our Instastories for what goes on behind the scenes!. 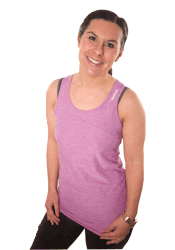 Our classes are all back to normal this week , and we have our new Body Sculpt class on Tuesday and Saturdays. Its a class combining cardio with strength and conditioning moves, to help tone and strengthen the entire body. We also see the return of our After School Yoga class at Believe and Be , Consett for kids age 4-8. Monday Afternoons 4,15-5pm . Post Natal Pilates is also back on a Monday Morning 1030am-1115am at DanceMax, Consett , and this year we also have a class on a Friday morning at Langley Park at the lovely Taylored Fit Physio studio. Family Yoga is also back from this Saturday 1th January 1015am-11am at Delves Village Hall. For kids age 3 plus. Our Pilates 1-1 and private Small group slots have also been selling really well, if you would be interested , just drop me a message. Our Fat Burning Small Group programme is sold out for January, but we already have sign ups for February , so if you would like to get on the list for the February Small Group starting Mid Feb, just drop us a message. Body Sculpt 7pm-7.30pm @ Tesco Community room, Consett £4.00 – This class has limited space and sells out quickly, lease check with us regarding availability. Can you believe it’s the 1st December???? 24 sleeps until Santa . Seriously where on earth has 2016 gone?. It really has flown over!. The festive season has already kicked off here at Mis-Fit HQ, it was our Christmas party last Friday night. , The Mis-fits all swapped their workout clothes and trainers to get our glam on , dance shoes were polished up to dance our way into the party season. We had a brilliant night . I love seeing everyone come together and having a good time. 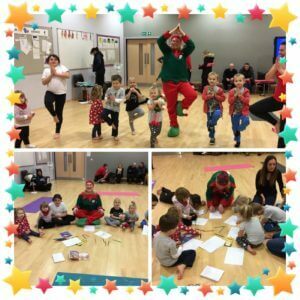 Then on Monday it was the turn of my little Yogis to get into the festive spirit , We had a special festive yoga class, and Santa sent one of his elves along to join us!. Its a very hectic time for Elves and the pressure is on, so Santa though a spot of Yoga for Chocolate the Elf would be just the tonic. Chocolate came into class as we were warming up, you should have seen the kids faces! I think they were a bit speechless at first, but they all welcomed Chocolate . The kids were loving it, and I think Chocolate did too :-). so many fun things planned over the next few weeks , I’ll be keeping you all updated on all the goings on here at Mis-Fit HQ. I’d love to hear about your fun festive adventures too , so come follow me on Instagram @littlemisfitjojo using the #misfitfestivefun or come visit us on Facebook – www.facebook.com/lilmisfit1 plus we’ll be doing a little vlogging including some workouts over on YouTube channel little mis-fit.